The power of F4. If you are working with a Microsoft Office document, say Excel, and you perform a certain step, such as inserting a row in an Excel spreadsheet, you can swiftly repeat this step by using the F4 key. If, immediately after inserting the row, you realize that you meant to insert two rows, not just one. 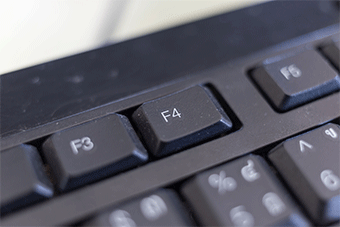 Instead of re-executing the keystrokes that you used to insert the row the first time, simply press F4. Excel automatically inserts the row for you. By pressing F4 in a Microsoft Office application, such as Excel, Word, and PowerPoint, this function causes the application to repeat its last command.